Our support for the school includes sponsorship of the Ron Dearing UTC Boardroom which has been branded with imagery illustrating our work with blue light services and critical control operations across the UK and abroad. The branded Boardroom also promotes our vision to inspire digital leaders of the future in the city where our business was founded and continues to prosper. Ron Dearing UTC has been established to create a pipeline of talented and work-ready young people with advanced digital and engineering skills. The school is supported by Founding Partners the University of Hull, KCOM, RB, Siemens Gamesa, Smith & Nephew and Spencer Group, who have been joined by a powerful line-up of other leading local employers, including APD. Ron Dearing UTC’s employer-driven education model and curriculum combines academic excellence in the core subjects of English, maths and sciences with specialist studies in digital technology and mechatronics – a combination of computing and engineering. Mike Isherwood, our Managing Director, said: “We’re proud to be a Major Partner of Ron Dearing UTC and to support the school’s important mission to develop young people with the digital skills that are so much in demand by local employers. “We’re huge fans of the school’s employer-led model and how the business partners are so heavily involved in shaping the curriculum to ensure students gain the skills, qualifications and practical experience that companies like us really need. 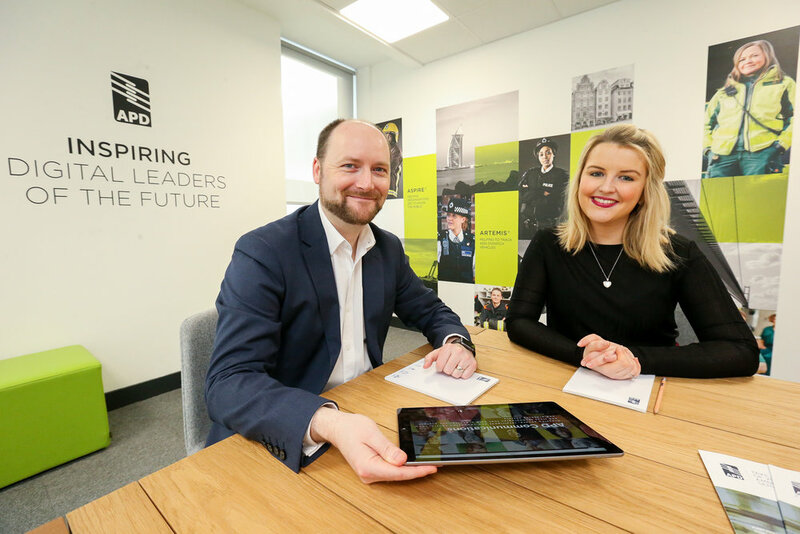 “We have a well-established graduate employment and internship programme with the University of Hull and backing Ron Dearing UTC is the next natural step for us to take in developing and promoting digital skills in the region. Founded by two academics from the University of Hull, we've been developing cutting-edge digital technology in the city for more than 30 years. We employ more than 100 staff, mainly software developers – our super-talented “geeks with goals” – and our teams create critical, life-saving software used by the police and other emergency services organisations across the UK, as well as transport and aviation operators nationally and internationally. Based at Newland Science Park adjacent to the University of Hull, we provide technology that supports one in two police forces around the UK; helps to run the London Underground; and is a key part of the critical communication infrastructure at Dubai International – the world’s busiest airport. APD Marketing Executive Jane Cross said: “Our partnership with Ron Dearing UTC enables us to play an active role in inspiring and cultivating the next generation of software developers and engineers – the digital innovators who will drive the region’s economic growth. “It also presents the opportunity for us to promote the exciting career opportunities available to students on their doorstep. Ron Dearing UTC opened in September 2017 with an initial intake of 230 students and will grow to a capacity of 600 learners, aged from 14 to 19, by September 2020. Students apply their academic learning to real-life projects set by the employer sponsors, study for professional qualifications in high demand by industry, and are guided by business mentors from the partner companies. Ron Dearing UTC Principal Sarah Pashley said: “We’re delighted to have APD Communications among our Major Partners and as the sponsor of our Boardroom. “It’s exciting for our students for us to work so closely with a fast-growing company pioneering world-class software solutions right here in Hull. If you'd like to find out more about the careers opportunities available at APD, please get in touch at hello@apdcomms.com or by visiting our careers page for the latest updates.